I love baked potatoes. But the potato setting on my microwave has failed me so many times, leaving me with shriveled and lifeless potatoes. Thanks to a fellow Michigan crafter I’ve stopped shriveling potatoes. 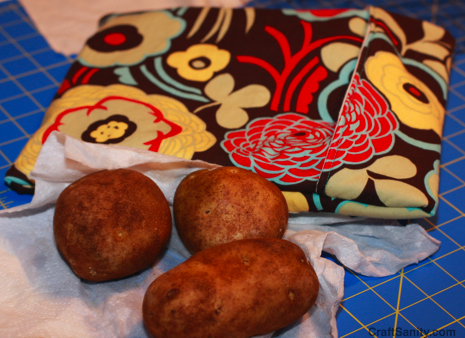 Gerri Nielsen gave me one of her fabric potato bags and I swear it’s taken the frustration out of rapid potato baking. These fabric bags create a sort of a steam chamber for the potatoes that come out soft and tasty 4 to 8 minutes later. I’ve been so happy with the results that I whipped up a few more bags. Step 1: Place your your interior fabric right side up. Place the outer fabric on top right side down, followed by the piece of batting. Pin the stack and sew around the perimeter leaving about a 4-inch opening on one of the 11-inch sides for turning. Step 2: Turn right side out and press with iron. Top stitch across the short side to stitch the opening closed. 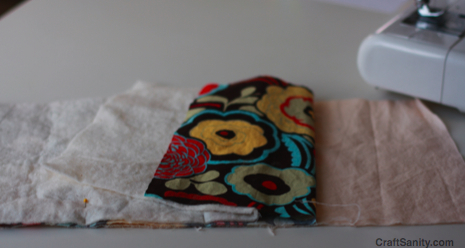 Step 3: With the right side facing up, fold the rectangle into the bag shape. First, fold the top down about 3 inches, then fold the other end of the rectangle up to meet the top edge, overlapping the edges by about a half inch. Pin and stitch along each long side. Step 4: Turn right side out and you’re ready to bake some potatoes. Baking directions: Wash potatoes and wrap in the paper towel you use to dry them. Do NOT poke holes in the potatoes. Place the potatoes in the bag and microwave for 4 to 8 minutes. Check the potatoes every 2 minutes to be safe and do not leave them unattended. Buy a potato bag: If you want a potato bag, but would rather not make one yourself. No problem. Gerri Nielsen will make you one for $10. Write her at 14426 U.S. Hwy. 45, Bruce Crossing, MI 49912-8704 to place your order. Watch the video: Today’s “Take Five” TV segment was a bit off the hook. Watch the clip to see me forge on with my demonstration of the making of a potato bag after I bust my sewing machine on live TV. Fun times, folks. cooking craftcraft tutorialCraftSanity on TVkitchen craftspotato bag tutorialWZZM "Take Five & Company"
I didn’t realize I needed to use cotton thread (didn’t read closely enough) and just sewed up two bags with Coats and Clarks all purpose thread, which I just found out is polyester. Will it be dangerous to use my bags in the microwave? and the way iin which you say it. You make it entertaining aand you till take casre of to keep it sensible. I can not wait to read faar more from you. This is actually a tremendous web site. I made a few of these bags a couple years ago and made that same mistake, Mary Ann. The one my daughter got actually caught fire in the microwave d/t the use of polyester thread. Mine has charred but is still usable. Didn’t get any report back on the other, which was a gift. Maybe they never used it?? Cotton is the way to go: fabric, batting and thread.